THE NIGHT SKY OF SOUTHERN AFRICA offers some of the best stargazing on the planet. Consequently, the indigenous people of the subcontinent have been exposed to a cosmic clarity since time immemorial, developing complex knowledge systems in the process. 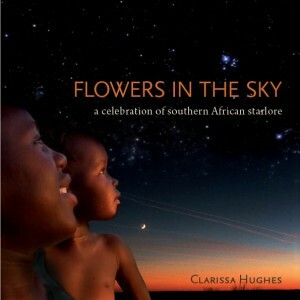 Flowers in the Sky is a collection of stories that provides insight into our traditional cosmologies. Legends of failed hunts, of Lynx losing her jewelry and moonwater pouring out of the sky are interspersed with common practices such as: why the Chief awarded a cow to the first person to see Canopus, and why Achenar’s rising was a time to avoid getting married. The introduction of a child to the moon exhibits the kind of intimacy that existed between people and the celestial bodies and highlights the sense of participation in universal events that our forebears acknowledged – one that the author, Clarissa Hughes, maintains is useful in facing the challenges of the twenty-first century . Why are the Digging Stars called by that name? Why was their dawn rising a significant event on the annual calendar? What do they represent in the minds of the people? And how does this relate to scientific discovery? These are some of the questions the author tackles in this sensitive and timely work. Told in an empathic style, the explanation of the symbolism is often inspiring, at times confirming scientific discoveries in the exquisite language of metaphor. Flowers in the Sky is essential reading for anyone interested in astronomy, indigenous cultures, and the links they share. Available directly through the author as only a small quantity left. “What an absolutely delightful book, I shall recommend it to all of my friends and acquaintances as a ‘must have’ African book on their bookshelves. Your images more than live up to the prose; it really is well done and was a great pleasure to have been of some small assistance in its production. I hope it is a great success!” Lance Kinnear, 9.8.2012. I heard you speaking with Jenny on 702 this afternoon and you mentioned something about the southern cross and the giraffes and I just missed the bushman word that you mentioned meaning “rising above the trees”. I am just wondering what that word was. Thanks, Nicky. The Setswana word for giraffe is ‘thlutlwa’ which means ‘rising above the trees’. A friend recommended that I buy your book Flowers in the Sky. Can you please let me know who the the indigenous people of the subcontinent are that you refer to – is it the Khomani san people and who provided you with the information? The reason I am asking is I was thinking of buying the book as a gift for a friend who is interested in the san people/ the environment/ stories told by the bushmen ……. The information was gathered from a variety of sources, both oral and written. There is a full list of references at the back of the book. The indigenous people referred to are, amongst others, Nguni peoples, Bushman groups and Tswana and Shona groups. I interviewed a Khomani, called !Unna Rooi, who was a great inspiration. The book will make an excellent gift and has been hailed as a ‘must-have’ for anyone interested in African culture and astronomy.